A healthy and yummy breakfast is what you deserve to fill your stomach and that you get in Ragi Rava Idli. 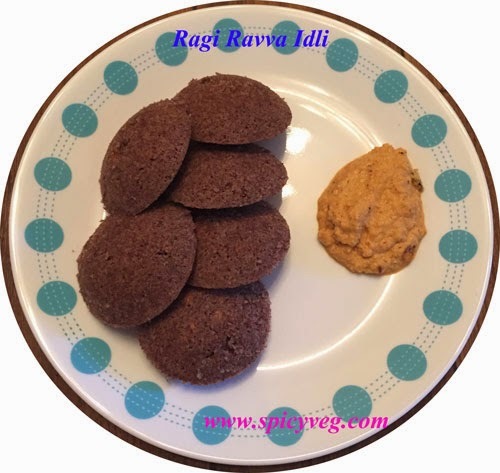 Ragi Rava Idli is a delightfully healthy way to start your day.Ragi is the richest source of Calcium among cereals and Calcium is vital for bone health. The Ragi Rava Idli recipe is a healthy preparation of the traditonal Rava Idli that is made with just Semolina. In this Ragi Rava Idli recipe I have combined the ragi flour, also known as the finger millet flour along with semolina (rava) and spiced it up with green chillies, mustard and curry leaves. 2. Allow the mixture to rest for 10 to 15 minutes. 3.Heat 1tbsp oil in a pan,add mustard seeds and curry leaves and allow it to crackle. Turn off heat and keep aside. 4.Stir in any additonal water if the batter is become too thick. 5.Add the seasoning, green chillies, ginger, enos fruit salt or baking powder and the tablespoon of oi to the prepared idli batter.Mixwell. 6.Pour the Ragi Rava Idli batter into the idli plates. Place the idli plates into the Idli steamer er and steam the rava idli's for 10 -15 minutes. 8.Once steamed, remove the Ragi Rava Idli from the steamer and keep aside for 5 minutes. 9. Use a spoon to run through the sides of the idli plates to remove idli's. 10.Serve the Ragi Rava Idli's with Spicy Red Coconut Chutney for breakfast .